Moving? Let Us Make it Easy! Moving is a big job and can be a very gruesome experience. Allow us to take on your next move! Our team of professionals can pack your belongings, load up, and move you to your new home! Did you order an item and are unable to transport it to your home? Do you think their rates are too high? We will go pick up your merchandise, personal belongings or property and delivery it to your desired location, all at an affordable flat rate! With Mainstream, you can expect a Hassle Free Consultation! Our customer service professionals will collect your details and provide you with a competitive rate! Be sure to take a look at our pricing guide for reference. Is your family getting ready to move out? Call us today, schedule for our team of trained professionals, Do you have some heavy furniture or bulky items that you just can’t move anymore. Don’t strain your back or get injured in the process. Hire professional moving helpers whom you can trust. 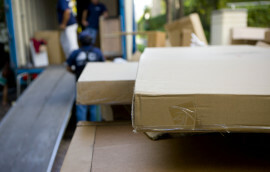 We take special care of your belongings by bringing the right moving supplies and equipment. We are ready to assist you with it all. We know that your time is important and will treat it and your belongings with special care. Need to deliver a few items From one location to another? Need to be delivered securely, safely & on-time? Need an invoice? Need moving helpers on a regular basis? Need a team who’s reliable, professional and courteous? If your a business owner who has answered yes to one of these questions? then call us today. Our team highly skilled professional are ready to assist you with any of these challenges you might facing. Call or Email us at our normal business hours. Allow our business to help you pick-up an item that you are purchasing from someone or somewhere. Service consists of only transporting one/two or a few the items to be picked up from place of business or residence & delivered to a home or business; such as, appliances, set of furniture, Electronics, boxes, plastic containers, piano, safe, etc. There is no set rate for this service. Rate’s vary and are determined by item, location, and distance traveled. I needed a quick pickup and delivery and the guys was able to get me my item within an hour of the call. Thanks again! Thanks for getting me all moved last minute. I will be sure to tell my friends about you guys!